If any of these proves of value to you, please feel free to donate via PayPal. These are various things I have worked on that I am happy to share with the knitting community. I just opened a Ravelry store and will also be hosting my patterns on Ravelry. This a wonderful lightweight scarf. The cable is a little challenging, but overall the pattern is pretty straightforward and quick. I call it the Leaping Dolphin for the way the cable dives in and out in a sea of ribbing. The pdf is also available on Ravelry. 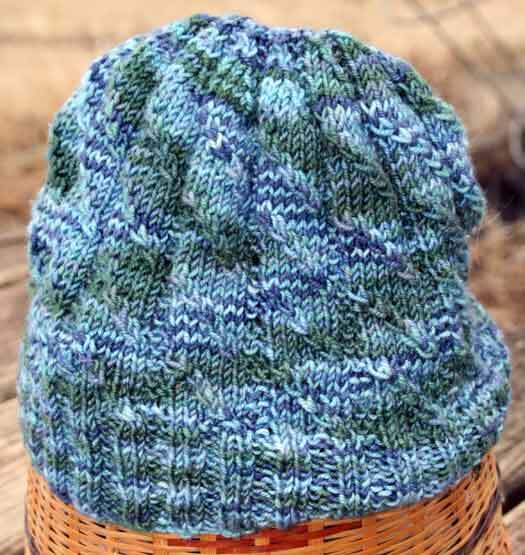 This is a great hat and an easy knit. It has great textural interest for plain yarns (gorgeous in shaded solids) but is also very fun in variegated yarns. A matching neckwarmer will be coming soon! Click here for a downloadable PDF file. 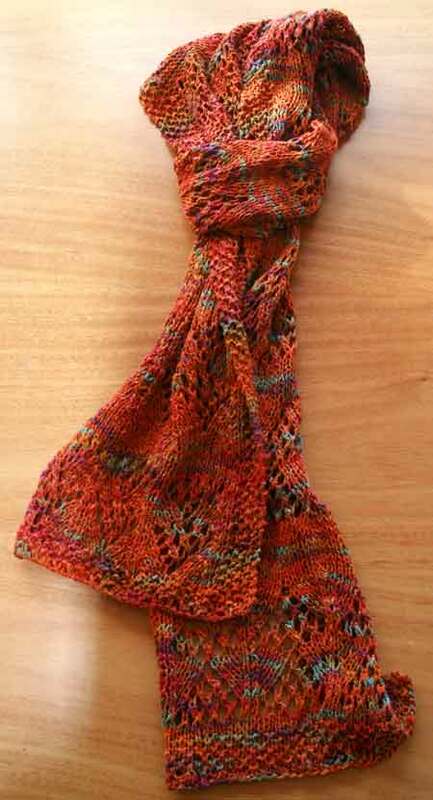 This is a variation on the Birds Nest Scarf from Folk Scarves. You will need to buy the book for the base pattern and then follow the directions. 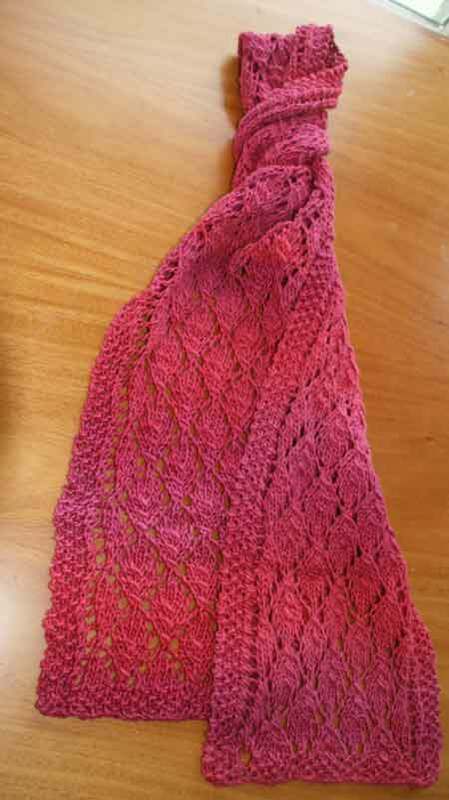 This is a lovely easy pattern for a new lace knitter or anyone who wants to knock a scarf out quickly. It looks great in a wide variety of yarns and is an easy 8 row repeat with all the wrong side rows in purl. Click here for PDF instructions. Please note that no one but me has test knitted this yet, so there may be errors. 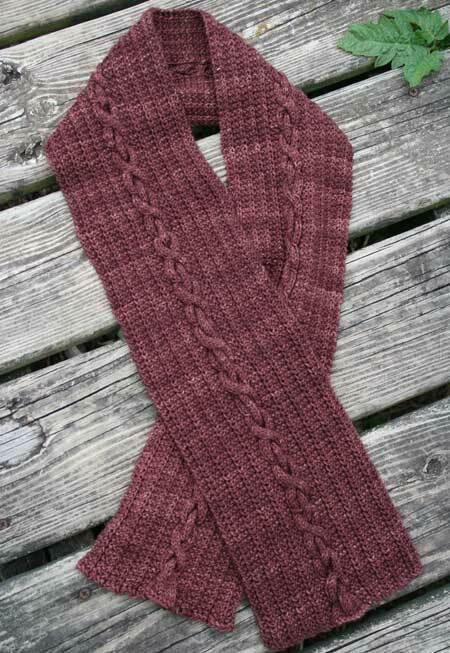 This is a quick and easy scarf pattern that is attractive on both sides. It doesn't curl and it shows off handpaints very nicely. I did this a while ago and can't find pictures of it, but am knitting one up for a Christmas present and will post when complete. Note: I tweaked these instructions a little on 9/20. 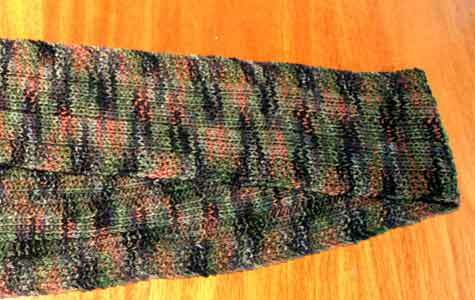 This scarf was done with a single skein of LL Shepherd Sock in colorway Camouflage. This is the updated version.